God spoke these wonderful words to his Son when Jesus was baptized. God feels the same about us when we follow our Savior's example and are baptized, too! 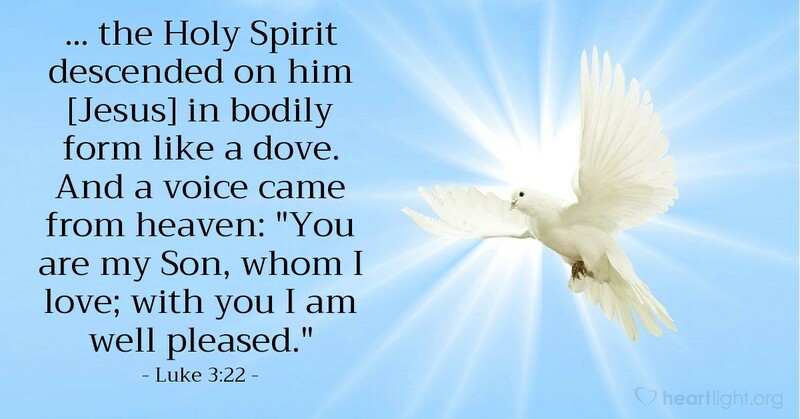 Jesus pours out his Spirit on us (Titus 3:4-7) guaranteeing that we are God's children (cf. Ephesians 1:13-14). No matter what Satan may do to make us doubt it (cf. Luke 4:3), we can confidently know that we are God's beloved children, with whom he is well pleased! Because of the Spirit, we can call God our Abba Father (Galatians 4:6) knowing that the Spirit intercedes for us making even our inexpressible thoughts known to our Father (Romans 8:26-27). Abba Father, I thank you for making me your child and making me an heir of your gracious inheritance. Please give me confidence to withstand the lies of Satan who tries to make me doubt my relationship with you. Thank you for your Spirit who helps even now by interceding for me as I pray. In Jesus' name. Amen.